A report surfaced from the Examiner this morning that suggested Samsung's U.S. variants of the Galaxy S III won't be receiving Android 4.1 Jelly Bean until 2013. The report cited a Samsung spokesperson, so we reached out to our sources with the company to see what's going on. It turns out that the Examiner's claim isn't the case at all. Our sources said to "keep an eye out for an update on GS III/Jelly Bean very soon." So, the good news is it sounds like U.S. consumers won't have to wait until next year for the update. Hopefully we'll hear more in the coming weeks. Update: And, there we have it. Just a few minutes after this post went out Samsung made an official announcement that says the Galaxy S III Android 4.1 update will launch in the "coming months." 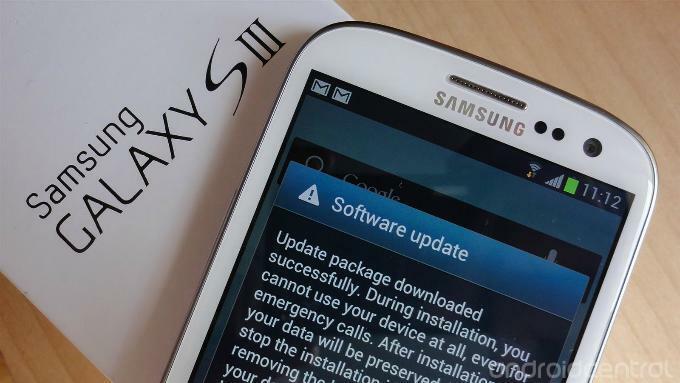 The company said that "the update will be made available both over the air and as a download via Kies, Samsung's content sync and software update solution. The specific timing and update method will be announced by each carrier partner, AT&T, Sprint, T-Mobile, Verizon Wireless and U.S. Cellular." Additional information can be found in the release below. DALLAS — October 17, 2012 — Samsung Telecommunications America, LLC (Samsung Mobile) – the No.1 mobile phone provider in the United States and a subsidiary of Samsung Electronics Co., Ltd., the No. 1 smartphone provider worldwide1 – continues its commitment to bringing the latest innovation to market with the rollout of Android 4.1, Jelly Bean, the latest version of the world's most popular smartphone operating system, to all Galaxy S III smartphones in the U.S. in the coming months. o Low light photo mode takes advantage of Galaxy S III's best-in-class High Dynamic Range (HDR) capabilities and offers an optimized mode for low light and indoor photos. · Pop Up Play Update: Users can now easily resize or pause the Pop Up Play picture-in-picture video window, taking full advantage of the Galaxy S III's powerful processor and large 4.8-inch screen. · Google Now™: Google Now gives users the right information at the right time, like how much traffic to expect before leaving work, when the next train is scheduled to arrive at the subway station or the score of a favorite team's current game – conveniently delivered as notifications. Additionally, Google Now provides powerful voice assistant functionality across a range of domains, including weather, maps, navigation, search, image search, flight status and more. Google Now can conveniently be launched from the lock screen shortcut or by a long press on the menu button from any screen. In addition to the operating system update, Samsung and ESPN worked together to integrate AllShare® technology into ESPN's popular ScoreCenter® application. This means Galaxy S III owners will now be able to wirelessly push on-demand ESPN global sports coverage and highlights from the ESPN ScoreCenter app to their Samsung SMART TV™. When on the same Wi-Fi network as a Samsung SMART TV, a sharing icon will appear within the ScoreCenter video player which allows users to seamlessly push what they are watching to the TV. The ScoreCenter app with AllShare integration is available today for download through S Suggest™ on all U.S. Galaxy S III devices. · AllShare® Cast Wireless Hub: The AllShare Cast Wireless Hub accessory allows users to wirelessly mirror their phone screen to any HDTV or HDMI® display. Whether it's sharing pictures, browsing the Web, playing games, streaming music, watching videos or projecting business presentations, users can control the action on the big screen wirelessly from their smartphone. AllShare Cast Wireless Hub even supports licensed content playback of premium TV and movies. · NFC One Touch Pairing Support: Galaxy S III can now pair with supporting NFC Bluetooth® accessories in a single touch. The Samsung Galaxy HM3300 Bluetooth headset will be the first Samsung portfolio accessory to support this functionality (available in the near future), allowing users to pair their headset by touching it to the back of their device.